Last meal? Forget it. When our time comes, we’d prefer to go out with a cocktail in our hands—and make it one with Kentucky bourbon, of course! 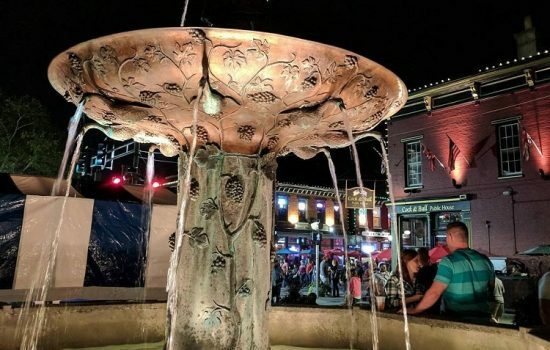 At every stop on The B-Line you can enjoy Kentucky bourbon straight up, on the rocks, in tasting flights, and mixed into a range of cocktails from classic to seasonal to creative—plus, however you order a drink, you can even ask the bartender to slide it down the bar at you like a movie scene if that’s your dream. We prefer not to risk losing a drop. 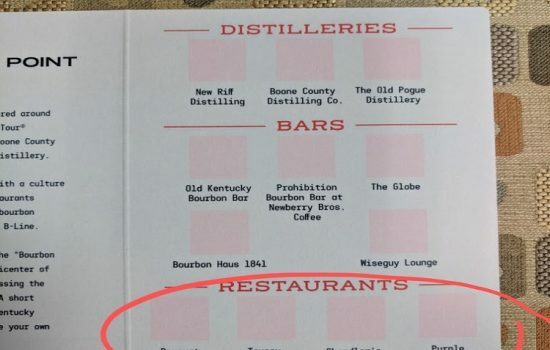 Among all the scrumptious sips available on The B-Line, these four bourbon cocktails combine other ingredients with the most heavenly (or, perhaps in some cases, devilish?) results. Whether consumed on their own as a liquid appetizer, paired with delicious bites, or in place of dessert, these cocktails won’t disappoint. This spin on the classic cocktail really puts the mmmm in Manhattan. 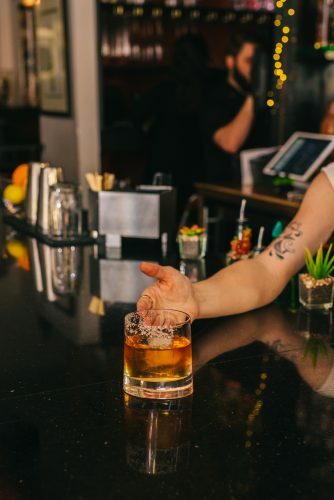 Woodford Reserve Double Oaked bourbon is mixed with Dolin sweet vermouth and Amaro Meletti—a complex spirit that boasts rich, layered tastes of caramel, chocolate, saffron, anise, and violets—plus a splash of Fees Brothers’ black walnut bitters. 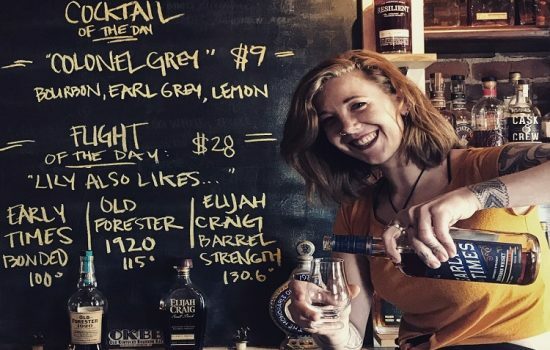 The Globe’s best-selling cocktail is “kind of bourbon heavy, yet smooth, approachable and easy to drink,” says general manager Ben Jordan. 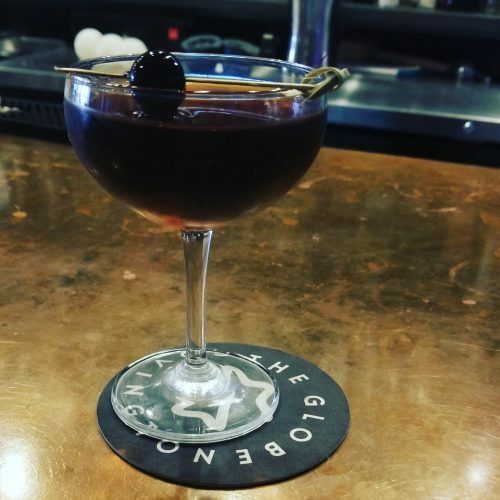 “It’s a neat Covington-inspired twist on a Manhattan, a bit nuttier and woodier.” Served neat in a coupe glass and garnished with a Luxardo cherry, the final result looks as classy as it tastes. So, extend those pinkies out while lifting the stem, ladies and gentlemen. Ready your lips for a whistle because when you lay eyes on this beauty of a cocktail whit-woo is a natural response. “It’s very showy,” says Kevin Rutkowski, who devised the involved recipe. “Watching it made is a huge show.” Old Forester Signature 100 proof bourbon is assembled into a coupe glass with vanilla demerara syrup, black walnut bitters, and a black cherry that’s been aged in brandy at least two weeks, and lit on fire. A dash of cinnamon and fresh expression of orange oil (both flammable) are tossed into the flame, transforming its hue from blue to bright white and helping it leap up to six inches. This showcase of Kentucky and Ohio flavors delights taste buds as much as eyes with homey flavors reminiscent of pecan pie. 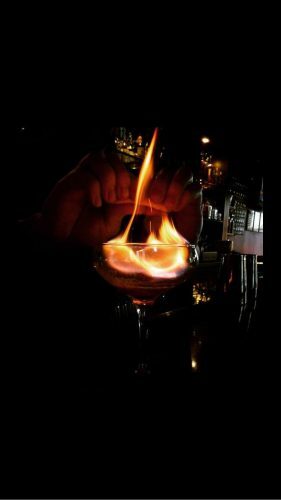 The name may be a tongue-in-cheek, play-on-words reference to how this cocktail’s spicy notes get into your nose the way some people nose into things, but you won’t regret how it awakens your senses each time you raise the glass. 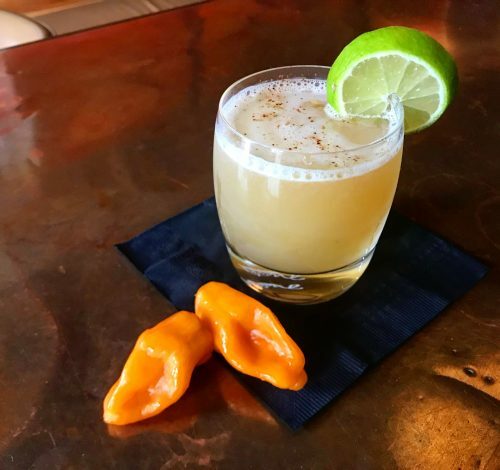 Splash your tongue with this compelling mix of Old Forester bourbon, house-made habanero and pickled jalapeño syrup, honey, fresh lime juice and lavender bitters, and you’ll just want to keep tipping back more sips. “It’s pretty spicy but tempered with sour, sweet and floral notes,” says Lily Dean, who developed the recipe. Garnished with a lime wheel and sprinkle of chili powder, this concoction proves that unexpected pairings can be the most interesting. Mere humans can only wish to be as well-balanced, smooth and richly sophisticated as this sipper. Bouquet Restaurant’s best-selling cocktail is a twist on a classic. Elijah Craig small batch bourbon meets sorghum syrup, a locally-sourced Viking salt blend, black walnut bitters, and hickory-smoked simple syrup that’s made in-house. The tasty results prove that sweet, smoky, bitter, and salty flavors do indeed play very nice together. “Our kitchen and bar work hand in hand,” says chef/owner Stephen Williams. 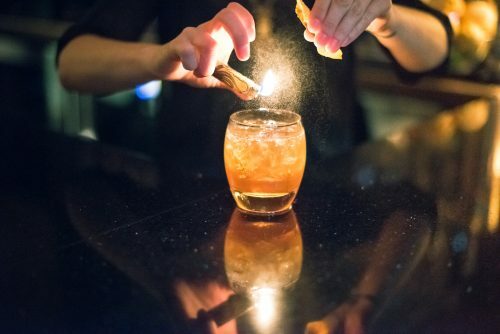 “We’ve been smoking quite a bit in our kitchen, so were inspired to give this classic cocktail a smoky spin.” Grasp bliss when wrapping your hand around a glass of this libation that’s poured over one large cube and garnished with a flamed orange peel.